My Writing Journal: Prompt Me ... Um ... Sunday? Prompt Me ... Um ... Sunday? So here’s the thing. For some reason I thought I had another Friday, so I was planning to work on my story this week and post it Friday. Only this Friday will be March, and the first Friday of the month is when I post my picture prompt. So my story is late, but at least I managed to get it done. A scorpion and a frog meet on the bank of a stream and the scorpion asks the frog to carry him across on its back. The frog asks, "How do I know you won't sting me?" The scorpion says, "Because if I do, I will die too." The frog is satisfied, and they set out, but in midstream, the scorpion stings the frog. The frog feels the onset of paralysis and starts to sink, knowing they both will drown, but has just enough time to gasp "Why?" The scorpion replies: "It’s my nature..."
His friends thought him mad, buying the cottage set in the woods on the cliff side, and yet they were often to be found wheedling an invitation to visit. There was something peaceful about the murmur of the sea, the shushing of the wind in the trees. It was almost magical. Despite being surrounded by nature, he created a garden - for the faeries, he said. 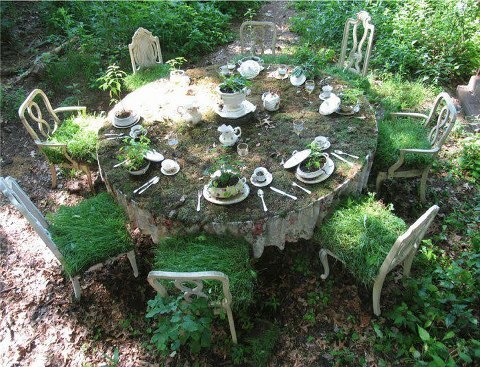 There were sunflowers and daisies, lilies and lavender, foxglove and tulips, honeysuckle and heliotrope, and set in the midst was a low, round table with eight diminutive chairs padded with moss. On a whim he set the table for tea with mismatched china. He found her there, at the bottom of the garden, a broken thing - lost, injured, just a shell - like so much flotsam cast up by the tide. At first he was not even sure she was alive, lying as she was amidst the stones, cradled in the illusion of tattered remnants of gossamer wings. The friend who had accompanied him to assess the damage left by the great wind storm the previous night told him to leave it there, no good would come of aiding such a creature. But he believed in magic and faeries and all the good that came with them and would not be dissuaded. When he brought her into his home, the friends who were waiting for the damage report advised him to cast it back from whence it came. He stood as they barred his way, the weight of her in his arms as insubstantial as a puff of smoke, and looked at them reproachfully until they stood aside. Love he had in abundance, and was always willing to share. She was almost transparently pale as he carefully laid her on the cot in the sunny guest room. He built a fire in the fireplace for warmth and washed her and cleansed her scratches with witch hazel. With the gentlest of touches he combed the detritus from her long dark hair. For a long time she lay unmoving on the cot, her slight form barely discernible under the faded patchwork quilt. Patiently he spooned milk, warmed and laced with honey, into her mouth. More often than not it dribbled back out again, but his quiet persistence was at last rewarded. She swallowed, and he all but wept with joy. When he spoke to her, she opened eyes that held a forest of green, but she made no sound in return. He named her Shaelyn, meaning ‘from the faery palace’ in Gaelic. He continued to feed her the milk and honey when she was awake, and when she dozed he read to her from slender, leather-bound volumes of poetry. It was several days before she was able to stay awake for any length of time and he left her side only once, to go to the village to buy more honey and oatcakes. On the fourth day she was able to sit up in the cot, on the fifth she was able to stand. On the seventh day she was able to walk to the door and back and he knew that soon she would leave him. The thought saddened him. On the ninth day she stepped outside, holding her face up to the sun, the gauzy rags she wore floating in the breeze. He stepped up beside her. “You can stay if you like,” he said, almost shyly, for in the short time they’d been together he’d grown to love her. She turned to look at him and he felt a sharp pain in his chest. Looking down in surprise he saw the slender knife she’d slipped between his ribs. His hand went to the crimson stain blossoming on his white shirt. He looked at her in confusion. “Why?” he gasped with his last breath. She looked at him dispassionately as the light in his eyes dulled. “Because it is my nature,” she replied. And without glancing back she turned away and spread her ragged wings.